If user password (also known as password to open) is either not set or known, it is possible to remove permission password instantly. 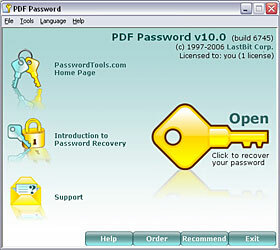 Unfortunately, if a user password is unknown, there is no easy way to recover the password to a PDF document. 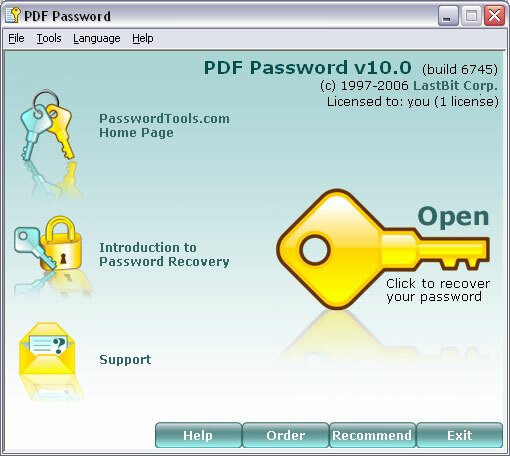 Universal recovery methods, such as Brute Force Attack and Dictionary Search, must be used. Unfortunately, due to a nature of an encryption method used in PDF files, the password search is very slow. The brute force speed is usually under one thousand passwords per second even on a top-speed modern PC. It means that long password recovery takes too long time. Use our Password Calculator to estimate your chance. Please read this article for more information on Universal Recovery Methods. Normally this value is set to zero and you should not adjust it. This value is used for continuing an interrupted search. If the recovery process is interrupted, on the next run this value will be automatically replaced with the last checked key, so the search will be resumed. Initial Key Value is a hexadecimal number in the range between 0000000000 and FFFFFFFFFF. Use these options if you want to use several computers to speed up the recovery process. Run PDF Password against the same PDF file on each computer, enter the number of computers (the same value for each instance) into the 'Total Computers' field and then enumerate the computers using the 'This Computer Index' (enter 1 in this field on the first computer, 2 - on the second one, and so forth). If you use just one computer, the default values (1 and 1) must be left unchanged. 2) The so-called Rainbow Tables Recovery. The main advantage of the method is speed; you can achieve the result within 1-3 minutes at the success rate over 99.7%. It is really close to 100%, but not 100%. This means that in rare cases this recovery method may fail. Another disadvantage of this method is the size of the table: you need to download and install a data table that takes several gigabytes.